LEGO DC Super-Villains all-star voice-cast and the entertaining story provides the same charm as past entries with that DC villain feel. The LEGO games have always followed a specific formula and rarely innovate from its standard recipe. What is guaranteed is that whatever licensed adventure you pick up it'll be full of licensed work from that universe including characters, locations, and lots of collectables. LEGO DC Super-Villains follows the same edifice as past LEGO games, delivering an entertaining and easy adventure teeming with DC villains. 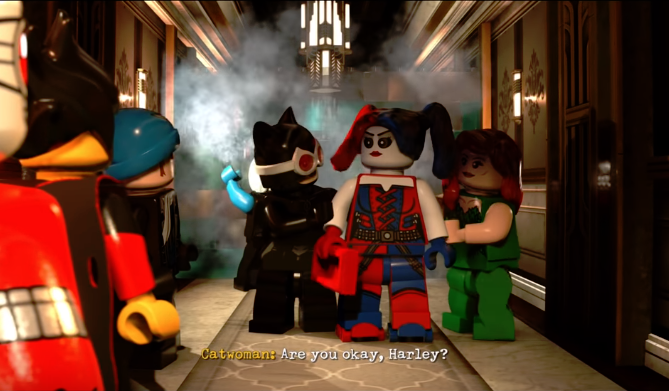 LEGO DC Super-Villains opens with the playing customizing their own creation that plays a vital role within the game's story. However, those wishing to play the more notorious villains can for the most part. Specific sections do require you to take control of the custom character but for most of the game, you have access to any of the many DC villains. Run around as Joker shooting his gun or take on Lex Luthor and hover above your enemies. Some villains have unique abilities required to progress. Joker can recruit henchman for example and Lex can solve specific puzzles. Many of the roadblocks are simple, requiring basic problem-solving skills such as using the correct character. What LEGO DC Super-Villains truly shines is the animation and voices. Like other LEGO games, everything is constructed by LEGO brinks and gives the world that blocky inventive look the series is known for. What brings the entire world together is the acclaimed voice-acting featuring Kevin Conroy as Batman, Mark Hamil as Joker, and Tara Strong as Harley Quinn along with Clancy Brown as Lex Luthor, Cree Summer as Mercy Graves, and internet famous and Kinda Funny Co-Founder Greg Miller as Polka-Dot Man. The voice work is one of the biggest highlights of the entire adventure. With each actor giving both notorious and less known figures a chance to shine. LEGO DC Super-Villains' story has the villains taking over after the Justice League goes missing and a mysterious group called the Justice Syndicate. The story is mostly predictable but the strong writing and use of whimsical humor and fun gags overshadow the issues with the narrative. Those exposed to the darker elements of the DC universe may find the story too childish but for this particular tale, the PG dialogue complements the overall theme. LEGO DC Super-Villains shares in the franchises difficulty. Death carries very little consequence and will automatically set you back where you started. Combat is also extremely easy, with the entire character roster sharing the same melee attacks and enemies falling to damage very easily. But this game was intended for children so it's hard to argue against the challenge but a harder option would've been welcomed. 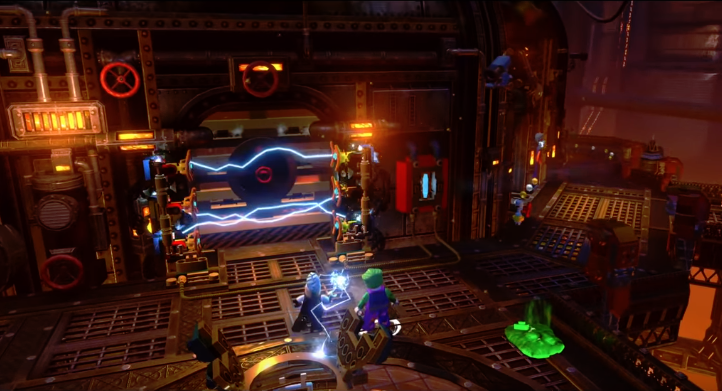 LEGO DC Super-Villains is an open-world game with missions segmented into levels and interiors. You can explore both Metropolis, Gotham, and other iconic locations within the DC universe to complete challenges and missions. In true LEGO franchise, there are a lot of collectables and trophy/achievement hunters will have a lot to do if they wish to 100% the game. Traveling throughout LEGO DC Super-Villains is a joy as vehicles can be easily spawned and if you want stealing a vehicle is an option. Cooperative play is available and can be great fun, allowing players to team up with unlikely combinations. If you love the LEGO games than LEGO DC Super-Villains provides much of the same. The child-like difficulty and humor are still here and the LEGO brink world is as charming as ever but it won't appeal to anyone who never had an interest in LEGO games. LEGO DC Super-Villains all-star voice-cast and the entertaining story provides the same charm as past entries with that DC villain feel.